Preheat oven to 350°F. Slice the baguette into ¼ inch rounds. Lay the slices on a baking sheet and drizzle with the olive oil. Place in the oven and bake until lightly browned, about 5 minutes. Remove and cool. These may be done up to a week in advance and kept in a sealed container. Put the wine, water, sugar and spices in a medium saucepan. Bring to a boil over high heat. Reduce the heat to a simmer. Add the pears and cook until tender. It will depend on the ripeness of the pears so it may be anywhere from 5 to 12 minutes. Remove from the heat. Take the pears out of the liquid to cool. Save the liquid and return the pears when it is cool. The pears will take on more color if they are stored in the liquid for a day or two. To assemble appetizer: Drain the pear halves and slice into thin slices. 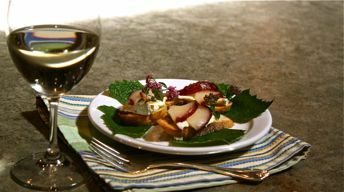 Spread a thick layer of the cheese on the crostini and lay a piece of pear on the top.